These knitted holiday mice are adorable and made out of worsted weight yarn. This is a great use for left over balls of yarn from other projects. The author gives instructions for knitting them flat or in the round, with worsted or sport weight yarn. The pattern is fairly easy to read and these could me made pretty quickly. This adorable ornament is cute enough on its own, but add the felted Christmas tree and the mini hanger and you can’t help melting. The instructions are fairly straight forward and you can sub in a different design besides the tree on the front of the sweater. 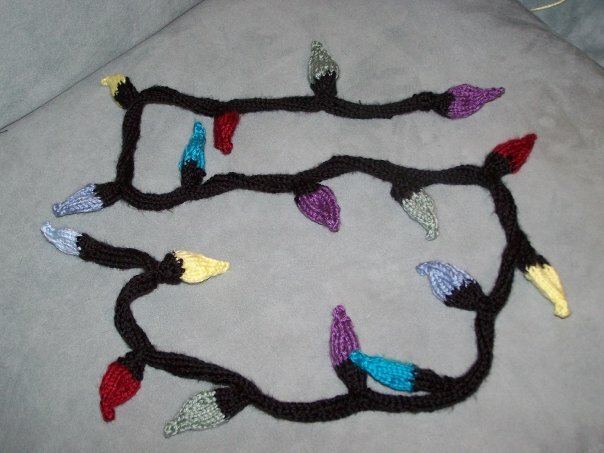 This is a quick pattern to make cat toys or decorations that look like Christmas lights. Another idea is to make these and attach them to an icord to make strung lights. This is a version that I made, but it looks better filled as in the pattern. Here is an easy ornament to make for the Santa fan. The hardest part about making this will probably be trying to find flesh colored yarn, but pink seems to work. All you need is a little scrap red, pink and white yarn and a half an hour of time. I really like this one but it’s a bit more complicated that the previous patterns. This shelf Santa is a doll made of dk yarn. The pattern isn’t in the best format and may be a little hard to follow. I’d recommend using a ruler or a magnetic map. It is sewn together and stuffed. While it may not be the most user friendly pattern, I think the end result would be worth the effort.